Which puppy was this made for? Here is the result from trying to install it in dpup4.84-beta4_2.6.30. All earlier gramps pets have run normal. And suddenly all the borders around the buttons in my JWM are gone! Did you include your own setup in the .pet? 7985: ERROR: grampsgui.py: line 316: Gramps failed to start. are you referring to Autofyrsto's pet, or mine? WARNING: osmgpsmap module not loaded. Geography functionality will not be available. WARNING: pyexiv2 module not loaded. Image metadata functionality will not be available. Edit: I wonder if you didn''t uninstall, your previous version of gramps, whether there could be any conflict? Your Gramps 2.6 and 3.3 pets run just fine, muggins, I was referring to the autofyrsto's 3.4 version in the post above. I run the Python+2.6.4-i486.pet package. I have Python, libgd2, libdb-4, graphwiz-2.2 and gramps in a directory on a USB HD (with my dpup485 on a DVD multisession-'partition'), and install when I need them. BTW, I just installed the gramps 3.3 with the same additional applications in my dpup4.84-beta4, and it runs just like it should. Well I downloaded dpup485, booted it, then installed autofyrsto's package. Whilst I didn't get the pixmap probs that tallboy reported, it still wouldn't run. Being a python dunderhead, I didn't want to try & unravel why, so instead made a .pet of the 3.4.0 debian package & it seems OK. If you want to try, see first post. Has anyone tried java-based Ancestris? I have made an SFS of all files ---> result: 13MB SFS File that runs in LazY Puppy. It would be an extra bonus if you cold add Graphwiz to your SFS, and maybe even ttf-freefont. These are all the additions I have used to run all Gramps 3.2.6, 3.3.1, 3.4.0 and now finally 3.4.1.1. in my dpup-484/485s, and all other puppies I have tried that are accepting .deb packages, I am sure they exist as non-debs too. I believe the python-pet I use is adapted for puppies, and is maybe not a full python installation. It all works perfectly. Oh forgot; BTW - good work! If i would know, where to find the exactly needed files, i would do this with pleasure. But I don't know. Found this one: Ubuntu which is a lot of files. Too much for me to figure out what is needed and what is not needed. I did (albeit briefly after your post) and found it quite good, once I got it and java set up together. I threw a 70,000+ person genealogy data-base gedcom at it and it looked unfazed. It told me I was still the person I think I am. I'm pretty much locked into the Windows-based "Legacy" program for my family dabblings (even paid them money!) but do keep some other like-programs (well, free ones) around just in case. I would just need to get Ancestris into an sfs and pet form to add this to my collection of "add-ons" for each new Pup. I don't know how the continual java updates would affect it however. So thanks for finding and mentioning it. Thank you, RSH. Except for the .pet files, I cannot remember where I got the .deb files. I may have gotten them from debian.org, one was maybe in the old stable debian release 'lenny', but the graphviz? Sorry, I don't remember, but the dpups I use are based on debian, not on ubuntu. I have been using Gramps under Kubuntu 11.04 until recently... and I don't recall ever having any problems. 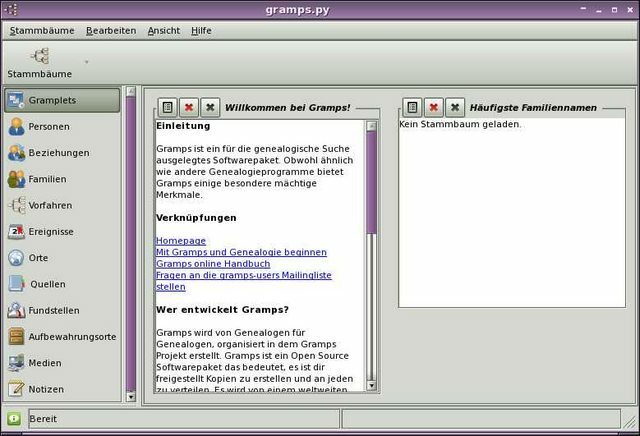 But recently I've tried to use Gramps on my laptop, under Puppy Linux 5.25 -- and I've been getting many problems and errors... which has been very frustrating. 1730: WARNING: geography.gpr.py: line 42: WARNING: osmgpsmap module not loaded. Geography functionality will not be available. 1803: WARNING: bottombar.gpr.py: line 90: WARNING: pyexiv2 module not loaded. Image metadata functionality will not be available. That's all python error messages, but the python is inside the sfs. I'm not comfortable with python, so I can't help here. Did you remove some stuff or install any other python or python included software? A few days ago I did read about some missing python stuff in the devx of lucid 528. Seems like the puppy python stuff isn't pretty well configured. Maybe this is generally a puppy/python problem?